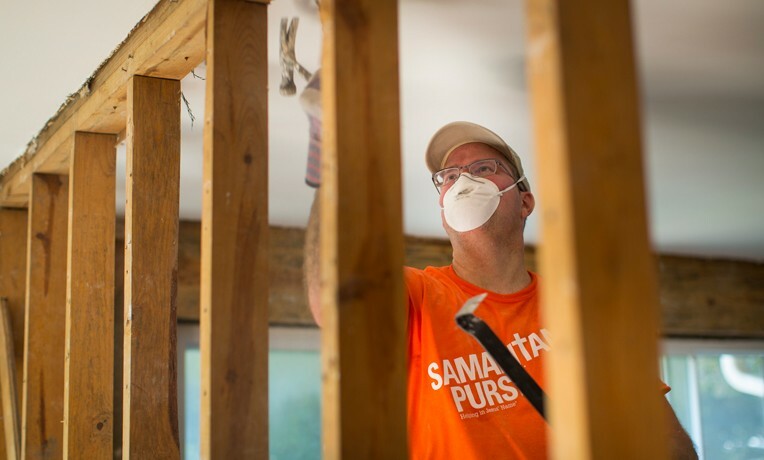 Samaritan’s Purse volunteers are now coming alongside devastated homeowners in Missouri and providing disaster relief assistance throughout the southwestern suburbs of St. Louis, which were ravaged by recent flooding. More than 10 inches of rain pummeled the Midwest during the Christmas season, causing the Mississippi River and its tributaries to swell, then overflow. Our teams are primarily focusing on residents living in the area where Jefferson, Franklin, and St. Louis counties border each other. They’re especially fanning out into the smaller cities of Arnold, Pacific, Valley Park, and Fenton. This region is part of the Meramec River watershed, which flows into the Mississippi. Southgate Church, in nearby Crestwood, is serving as our base of operations during this deployment. Our volunteers are performing “mud-outs”—readying houses for eventual repair. We’re tearing out waterlogged walls and insulation and pulling up flooring and damaged cabinets. And in some houses that were almost inundated, ceilings are being torn out. We’re also spraying for mold, as well as helping residents recover salvageable possessions. Not only are our teams providing practical help, they’re also sharing the hope and love of Jesus Christ. Crisis-trained Billy Graham Rapid Response Team chaplains are on hand offering spiritual and emotional care. On Monday, volunteers worked under two houses, taking out wet insulation, and then helping another man move what could be salvaged out of his storage building. The BGEA chaplains were able to talk with Glenda’s husband, Hayward. They’ve been married 72 years. The conversation turned spiritual in nature, and the chaplains shared about God’s unfailing love. When they asked the 91-year-old Hayward how they could pray for him, he responded, “I’d like to pray for the forgiveness of my sins.” They all bowed their heads and Hayward asked Jesus Christ to come into his life. Please pray for homeowners and for our teams in Missouri, especially as they brave cold temperatures and the possibility of snow in the coming days.